Group Visits at The Angel Hotel01873 857121work Group AccommodationThe Angel Hotel offers a warm welcome to Group Travellers and Coach Parties. We have 3 beautiful private dining rooms, from which we can serve groups breakfasts and dinners. We can also arrange guided tours of many of the local sites in and around Abergavenny, including St. Mary's Priory Church (the Westminster Abbey of Wales), local vineyards for wine tasting and Michelin Star dining at The Walnut Tree Restaurant. 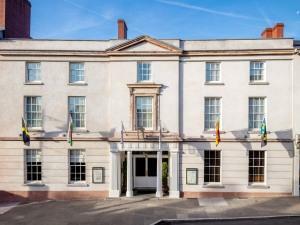 The Angel Hotel offers a warm welcome to Group Travellers and Coach Parties. We also offer the driver a complimentary room for groups of over 15 rooms.